Telecommunication systems—cell phones, TVs, the Internet and any other forms of voice, data or video transmission—have for decades relied on optical devices that require magnetic fields from strong external magnets. The main drawback of these devices is their large size and the significant weight and cost of the magnet. 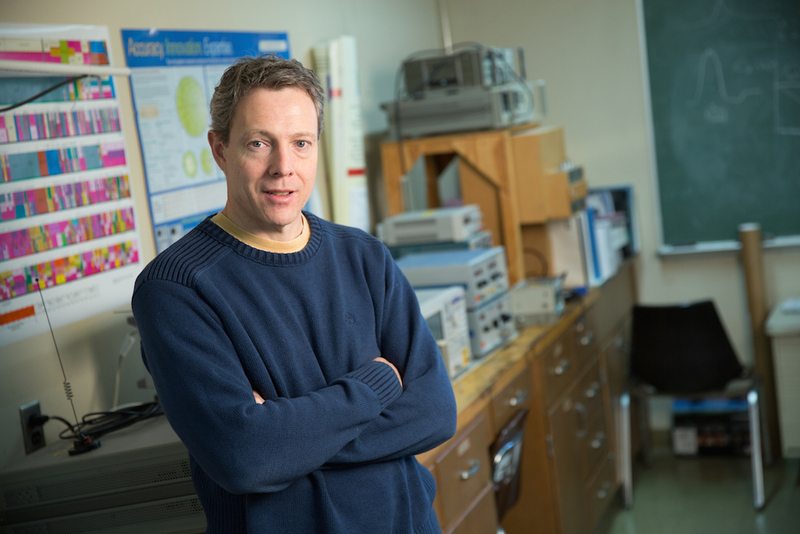 To design much smaller and lighter nanoscale communication systems, researchers like George Hanson, Professor of Electrical Engineering, have turned to two-dimensional materials: the thinnest possible type of material made of a single layer of atoms. Since it doesn’t have an inside, its entire 2D space is surface area, and it reacts strongly to anything placed close to that surface. Graphene, discovered in 2004, is the best-known example of a two-dimensional material with extremely high electrical and thermal conductivity and outstanding tensile strength. Consisting of a single layer of carbon atoms, this “wonder material” is light and strong enough to be attractive for many applications, from tennis racquets to nanotechnology and (perhaps) future space elevators. Since 2004, many similar materials have been identified, including a general class of gapped Dirac materials. With funding from the National Science Foundation, Hanson and his collaborators—physics professor Michael Weinert at UWM and two physics professors at West Virginia University—are using this class of materials to create sandwich-style nanoscale communication devices without heavy external magnets. “To build our ‘sandwich,’ we put a thin layer of magnetically doped material, basically atoms with a small magnetic force, in-between a substrate and a gapped Dirac material,” Hanson says. The researchers have already shown that the resulting magnetic field is capable of transmitting optical signals. However, this is only one of several approaches for building optical isolators and circulators, the two most common devices that transmit light in only one direction. In addition to gapped Dirac materials, the researchers are also evaluating photonic topological materials, which employ a different kind of physics to generate non-reciprocity. For a detailed comparison between the two, the team uses both computational and atomic-scale optical methods. Since a growing number of applications, including mobile devices, wireless technology and autonomous vehicles, rely on nanoscale communication components, the ultimate goal of the project is to provide guidelines on the most suitable materials for mass-producing them as efficiently as possible.